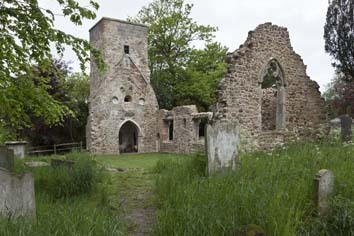 The ruin of the old church, replaced in 1869, shows it had an early C12 nave, a late C12 tower and a late C13 chancel; all were altered in the C14. A south aisle dated from 1821. The ruins of the old church near Ore Place are recognisable from the Sharpe Collection drawing (1797) and that by Adelaide Tracy (1857 or earlier). The architect of the new one, E P L Brock advised that the old church be kept (B 69 p339). The sill of a small window by the C14 segment-headed doorway shows the north wall of the nave is early C12. Later in that century the tower was added, though the almost flat head of the plain tower arch is a later alteration. It has been suggested that a round-headed window above (now partly open), flanked by roundels, shows the form of the west end before the tower was added (BE p577) but this is more likely to have been connected with a west gallery added in 1816 (WSRO Ep/27/II/30), which may also be the date of the head of the tower arch. The plain tower with low clasping buttresses and square north stair is like the late C12 one at Guestling. The resemblance was greater when there was still a pyramid spire, as the Sharpe drawing shows. Two north lancets in the chancel show it is C13, though there is no sign of any chancel arch. 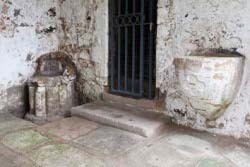 Between them is a large cusped tomb recess, used as the Easter sepulchre, which probably dates from the rebuilding of the chancel. If so, it indicates that the work was late C13 at the very earliest and the presence of other work which looks early C14 suggests all the work may have been done at the same time, including that in the nave. The east wall still stands to its full height with a two-light window of ogee-quatrefoil tracery, which largely survives and is the most obvious work of this date. 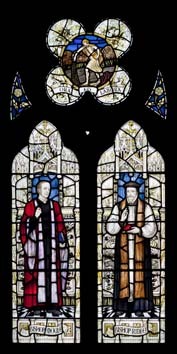 A further such feature was a two-light square-headed window with pierced spandrels in the nave, visible on the Sharpe drawing. Between 1797 and 1857 an additional one appeared, as Adelaide Tracy of the later date shows. This may have happened in 1821, when J Booth rebuilt the south aisle (ICBS), replacing one shown on the Burrell Collection drawing (1781), of which nothing is otherwise known. According to Sir Stephen Glynne, Booth’s aisle was built of grey stone with an arcade ‘of Tudor form’ (SNQ 16 (Nov 1967) p341), of which nothing survives. Other attempts at improvement included the west gallery of 1816 and new openings and a south doorway in the tower, but Booth’s aisle was damp (ICBS). As the church was too small and ramshackle for a growing district, the new one was built on a more convenient site. Brock’s advice was only partially followed, in that the old church was kept, but effectively abandoned. Indeed, it is possible that the nave and aisle were deliberately dismantled, since so little survives by comparison with the tower and even chancel. 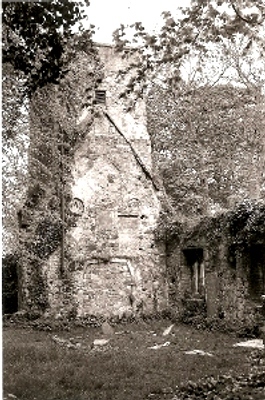 The site became overgrown and difficult of access (see black and white photograph of 1978), but it is now in the hands of the Sussex Heritage Trust. 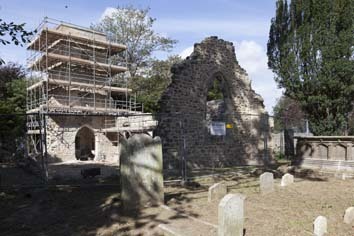 In 2012-13 the Trust undertook the consolidation of the ruins and graveyard Information about the sequence of construction was confirmed and finds from the excavations included fragments of stained glass, suggested to be C15. Access to the site has been improved and it has been landscaped. The responsible architects were J D Clarke and Partners (Planning application to Hastings Borough Council, see www.hastings.gov.uk). Font: A broken font, probably C12, is kept in the tower. 1. (Now in Hastings Museum) Damaged flat tombstone, probably to Sir William de Ore (d1333) with an inscription in raised letters round the edge and a further one in a circle near the top. 2. (Now in new church) Halle brass (see below). 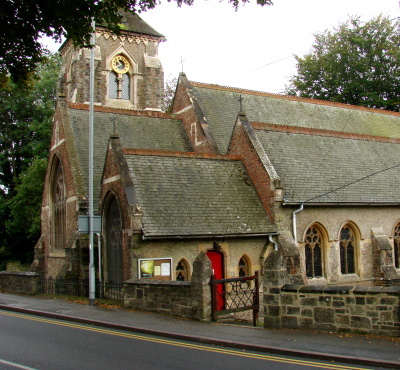 The new church is directly on the busy road along the ridge above Hastings and was built in 1869 in local brown stone with brick end walls, to Brock’s design (B 27 p591). 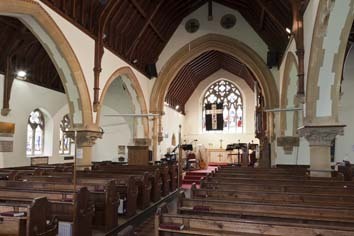 It has gabled aisles and windows with spiky and varied tracery. The tower is east of the south aisle on the side of the short chancel, with heavy two-light bell-openings. The top was altered in 1966 from a stone spire with giant lucarnes and corner spirelets to the present plain pyramid. Only the gargoyles at each corner recall the previous arrangement. Brock’s work can be heavy and even clumsy and the arcades, with big crocketed capitals on piers that are rather too slender and have big rings half way up, are typical. So are the fussy roof timbers with long wallposts and the shafts, corbels and mouldings on the chancel arch. There were further repairs in 1974-75 by the Stevens Partnership, the responsible architect being J F Woodward (ICBS). 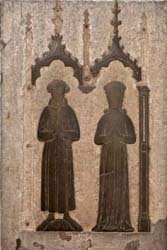 Brass: (North chancel) Small canopied brass of a civilian and his wife, removed from the old church. They are believed to be John Halle (d1421) and his wife (Mosse p110). Font: C19 with octagonal bowl with a quatrefoil each side and a multi-shafted stem. 1. 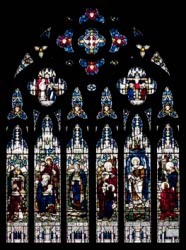 (East window) J Powell and Sons, 1916, designed by —- Read (Hadley list). 2. (South nave, first and third and fourth windows) J Powell and Sons, 1907-09 designed by J W Brown and F Mann (ibid) 19 (ibid); 1916 by Brown only. 3. (North nave, first to fourth windows) J Powell and Sons, 1919 by H S Hodges and E Penwarden; 1929 by E Penwarden and 1954 (designer not recorded) (all Hadley list). My thanks to Nick Wiseman for the colour photographs, except that of the exterior of the new church, and also for information about the recent repairs to the old church.